Welcome to episode 161 of the LJS Podcast where today I go over an in-depth analysis of the jazz standard “There Will Never Be Another You.” This is a fantastic tune that has a lot to teach us about traditional diatonic jazz harmony, with a few fun surprises along the way. Learn how to start approaching this great jazz standard. I really believe that in order to take a great solo over a jazz standard, or any song at all, that you need to understand how that song works. Yes, we need to be able to use our ears and that’s obviously the most important thing when it comes to being a jazz improviser. However, I believe that understanding how chord progressions work, how chords function and the context of the entire song – all of this is really important. And that’s why I like to spend some time analyzing jazz standards, going over how they work and try to dig deep inside of them. I believe that if we have this mentality, we have this knowledge, everything is going to be so much easier for us when it comes to actually composing in the moment, a.k.a improvising. 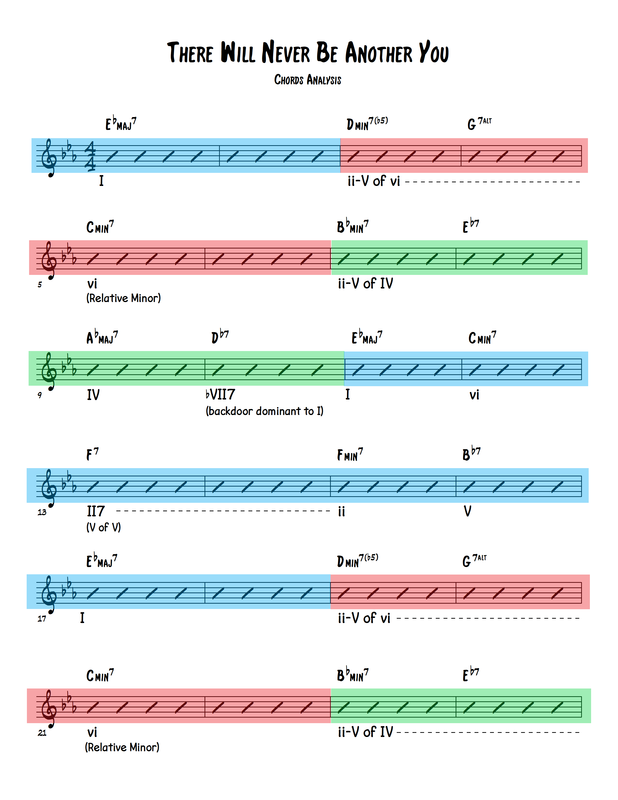 So today I’m going to be going over a very popular jazz standard There Will Never Be Another You and we’re going to take a deep-dive look into that and try to see what’s going on with the harmony. Thanks for listening to this episode of the Learn Jazz Standards Podcast. If you aren’t already, make sure you are subscribed on iTunes, Google Podcasts, Spotify, or wherever you listen to podcasts. I look forward to having you join me in the next episode! [Video] What’s a Backdoor Dominant? [Video] What’s a Secondary Dominant? I listened to this lesson without looking at the chords. That process stretched and solidified my ability to state, as you were teaching, the names of the progressions as they were encountered in the song. Excellent instruction that I would definitely enjoy more of. However, a bit slower pace explaining might help me grasp the content more easily. Thanks for the excellence. Great episode. I listened to podcast on Spotify. Really helpful breakdown on the sheet and the colour coding idea makes great sense too. I look forward to future podcasts like this. Once again thanks. Glad you found it helpful Anders! Major value bomb, Brent. Thank you! I think it worked well in the podcast, but much of it would have been over my head had I not been able to follow along using the color-coded chord chart as I listened to you. I'll need to review this podcast several times to absorb it, but your explanations were clear, and I'm now looking forward to digging into this tune – it has always been one of my favorites. Thanks for a great lesson! I found this episode to be easy to follow and very helpful. More like it would be great. Thanks. Thanks for all the great podcasts btw – they have been a valuable resource for me over the last year. Glad to help Jon, thanks for listening! Great analysis Brent. Really enjoyed it!!! I was able to follow along easily. Maybe next time you could show some more chord/scale relationships moving through the tonalities. I loved this episode and appreciate all the work that went into this site and youtube channel. I am now a subscriber and I have shared this site and podcast with others. I did listen to this podcast while following along with the chord analysis. Super helpful, super awesome. Many thanks to Brent for this and prior podcasts!! I am unable to study full time or in a schedule but Brent's timely jazz theory installments keep me going! Glad to hear it Richard! I thought this was great. Doing it in the podcast format (instead of watching a video) made me "focus my ears" more, so I found myself concentrating on what the progression sounded like (instead of just memorizing the names of the chords in order). Interesting, David, that does seem to make sense! Glad you enjoyed it. Great! Thanks for the feedback, Owen.